In celebrating the wonderful holiday season I am finishing up showcasing all the beautiful pages of the BELIEVE Chipboard Album I featured on the Royal Blog Tour. 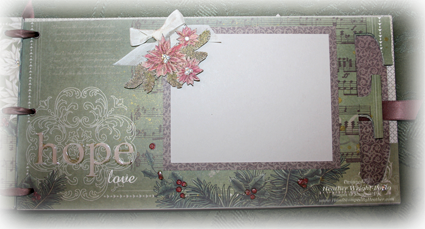 Here is the back of the "V" in BELIEVE and it shows you just how beautiful the Deck The Halls designer series paper is. I accented the berries with Crystal Effects and added Rhinestones to the center of the poinsettias, as well as in the upper, left corner. You can add your picture of the word JOY or a picture stip over the music notes. This is the front side of the last "E" in BELIEVE and my favorite page of this album. It again shows how beautiful the DSP paper is, the berries are accented with Crystal Effects, the HOPE is also decorated with Crystal Effects. Then there is a layered photo mat which as a very intrigue bouquet of poinsettias (stamped and cut out), tied with a bow (Very Vanilla Seam Binding Ribbon). The poinsettias image was stamped in Early Espresso Classic ink. Colored with Cherry Cobbler and Old Olive Classic Ink (using a Blender Pen), but highlighted with Bravo Burgundy and Always Artichoke Stampin' Write Markers. Rhinestones added to the center. Adhered to mat with Mini Glue Dots and Stampin' Dimensionals. 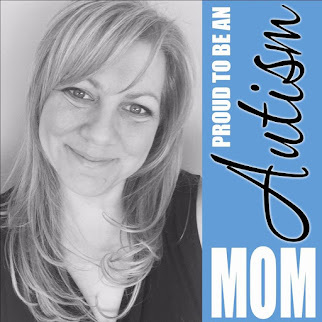 On this back side of the E, you will find the brown patterned DSP with 3 photo mats (one for a larger photo and then the two small squares). Stamped bells accent this page. These bells were again stamped in Early Espresso. The bell was colored with Gold ink (using Blender Pen), where a Gold Pen was used to highlight the bell's trim. The berries were painted with Cherry Cobbler and then Crystal Effects was added. The bow was also colored with Cherry Cobbler (using a Blender Pen). The leaves were highlighted with the Always Artichoke Stampin' Write Marker and then colored with Old Olive Classic Ink pad and Blender Pen. This is the last page of the BELIEVE album which feauted 3 or 6 photo areas depending on how you look at it (smiley). 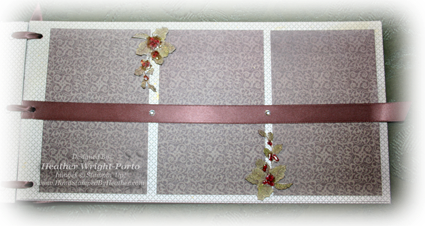 The chocolate satin ribbon runs across the page and accented with just 2 clear rhinesones. The holly took the longest on this page to color, cut and then to apply Crystal Effects. Images stamped in Early Espresso. 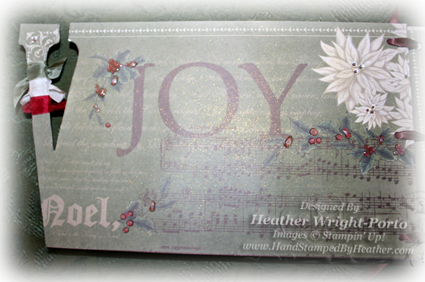 Holly colored in Old Olive Classic Ink with Blender Pen, and highlighted with Always Artichoke Stampin' Write Marker. The berries were colored in Cherry Cobbler and then Crystal Effects was applied. Please be sure to let dry a long time!!!! Then adhered with Mini Glue Dots. I hope you enjoyed this album. I truly love working with chipboard so keep a look out this year. 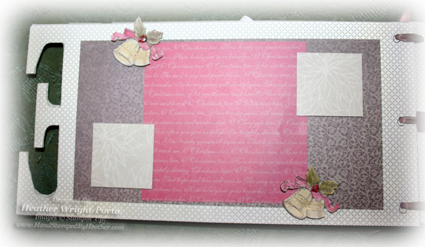 Coming soon...an entirely new section to my blog on Chipboard projects only. I love it that much!